This will be my last post for the day. The Lad had five apnea episodes yesterday, so we spent all night in the hospital. I'm taking the day off to rest and help care for him. Outside of the Larger cities of the Willamette Valley (namely Eugene, Salem, and the Portland Metro Area), Oregon is suprisingly Red State, and culturally closer to the Mountain West than to California. That's reflected in one of the annual promotionals run by Les Schwab Tires, a regional tire store chain. It's Free Beef Time at Les Schwab! A couple of years ago here in Eugene, a local bike shop tried to lampoon it with Fre Tofu Days. It flopped. It's a Traeger Lil' Tex barbecue. It's not gas, it's not charcoal -- it uses wood. Wood pellets, to be precise. They're made right here in Oregon, and apparently they're quite popular even in traditional barbecueing regions. 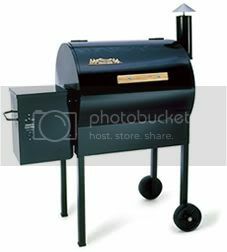 It's a true barbecue, not just a grill -- you can smoke, slow barbecue, or grill on it.